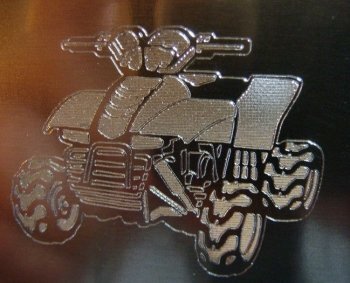 Engrave various materials professionally and quickly with our CNC engraving machines. 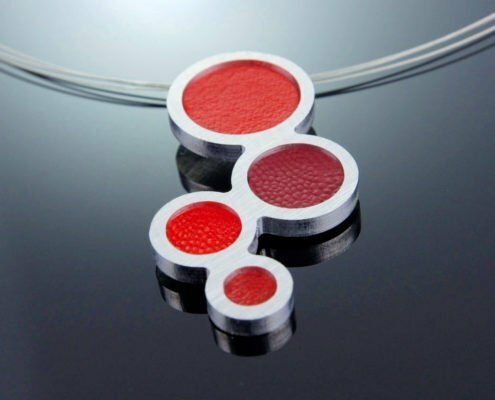 There is a wide range of applications which you can engrave with our machine accessories such as deep 2D and 3D engravings in stainless steel, aluminium, granite, marble and wood. Implement your ideas with the High-Z engraver by labelling workpieces or applying great decorations to your desired objects. 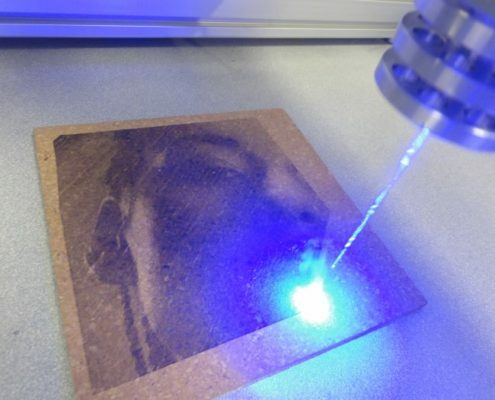 It doesn’t matter if you would like to engrave photos or 3D lithophanes. Combining our engraving machines with our rotation axis and other accessories you have nearly unlimited possibilities in making CNC engravings. A DIN standard does not yet exist for the definition. 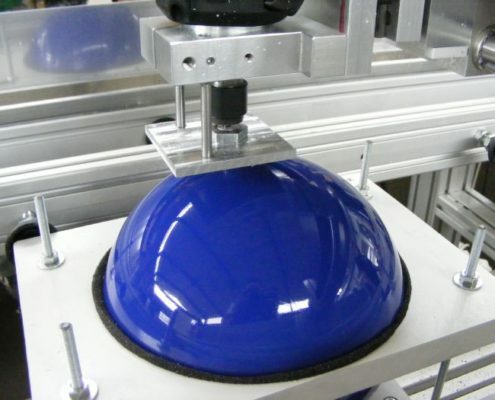 However, it identifies a specific machining process for decorating or labelling of objects. 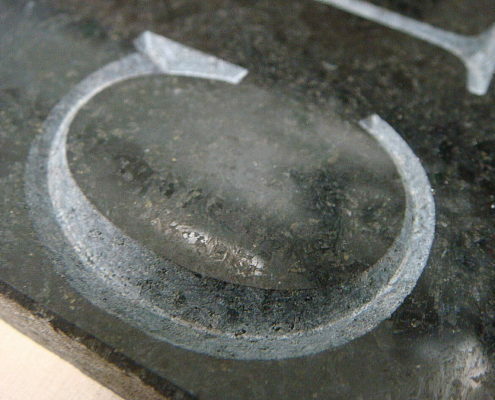 Engraving refers to a cutting work technique, which is mainly used for decoration or labelling on surfaces of different materials using an engraving tool which is made of solid carbide in most cases. This was before industrialisation and the consequent forthcoming mechanisation of most craft, a simple craft operation. It had no rotating but stationary tools for engraving. 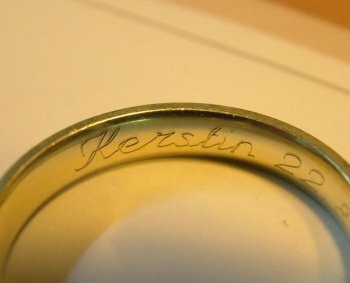 Therefore, until today, there are different types of engraving. 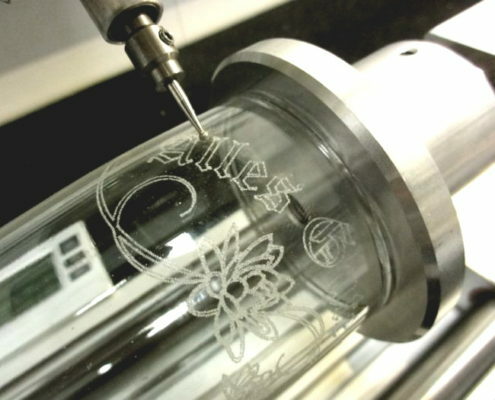 Today, engravings are made with manual engraving machines or with CNC engraving machines. 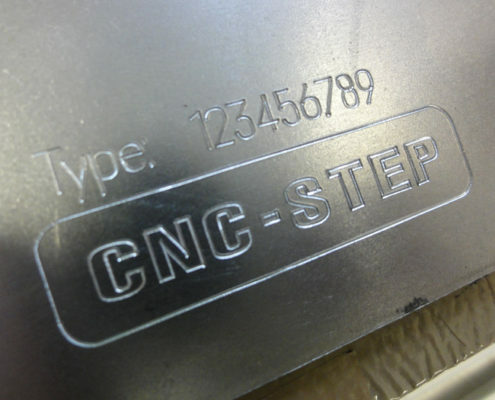 The CNC engraving machine processes the milling paths which the CAD CAM Software creates from the drawing and transmits to the control device. 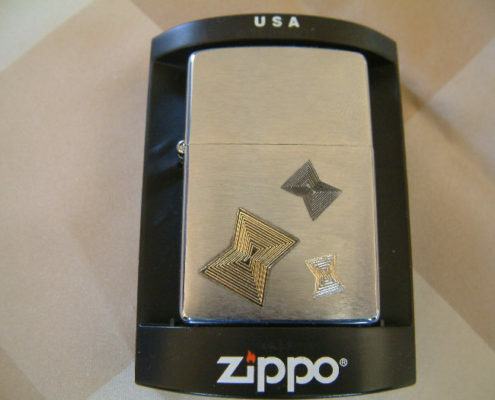 The entire engraving is computer-based and less error-prone than the manual engraving. 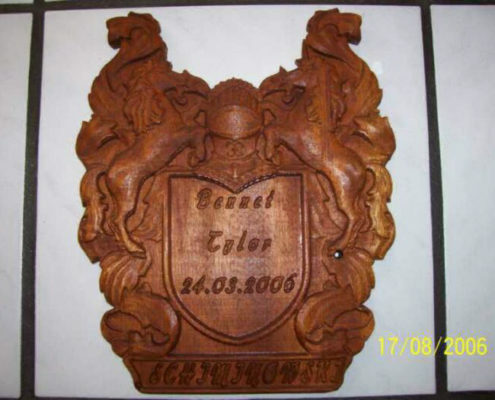 The Reproduction with a CNC machine is quicker and more precise than using a manual engraving device. It is also worth mentioning that you don’t have to stand by the workpiece during the engraving. 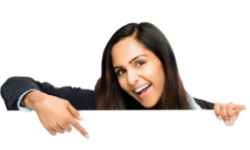 In the meantime, you can do other work which is significant for increasing your production. This engraving-technique was developed with the introduction of mechanical equipment. 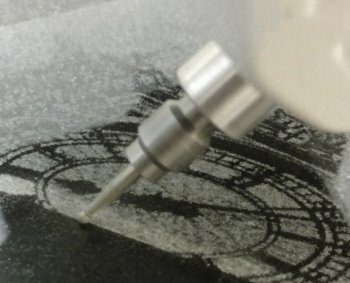 A tool called Engraving or Milling Graver (usually single-edged without cutting angle and clearance angle at the cutting edge) is brought in the rotation and immersed in the material to be engraved to remove material (usually only a few hundredths of a millimetre). Materials with different coloured layers (engraving plastics, chrome-plated brass plates etc.) incur as multicoloured engravings for signs etc..
Also suitable for engraving are grinding pins with diamond dust stocking for glass engraving and metal engraving, in which case the surfaces are roughened only. In this technology, a fixed diamond is used as a scoring tool to carve the surface of metals, for example, a few hundredths of a millimetre. 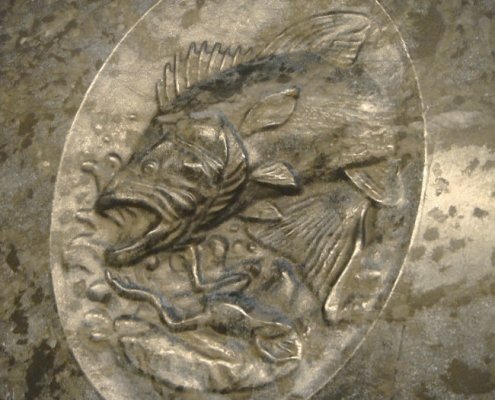 Inscriptions, decorations, ornaments and signs on metals such as copper, silver, brass, steel, stainless steel or glass and stone can be created. In classical hand-engraving, a tool with a wooden handle is used. This usually slightly curved tool has a very sharp blade with which it is possible to score the most materials except glass. The conventional hand engraving is still often used when thinning letters in gravestones etc., for example when pure handwork is required. The electric-engraving is related to the EDM and welding. 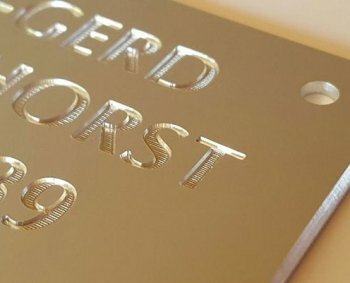 Hier wird ein durch die als Anode wirkender Metallstift bei Strombeaufschlagung in Schwingung zur Kathode versetzt ( als Kathode dient hier das Material, welches auch entsprechend mit dem Graviermodul verkabelt wird ) und der zwischen Kathode und Anode fließende Strom verbrennt das Material an der zu gravierenden Stelle. Die Schwingung des Gravierstiftes wird hierbei durch die Wechselwirkung zwischen Magnetanker und einem Elektromagneten erwirkt. Nachteil ist das nur stromleitende Materialien graviert werden können. Vorteil: Gut erkennbare Einbrand – Gravuren auf Hartmetallen oder HSS Stählen wie Sägeblättern, Fräsern und anderen Werkzeugen. 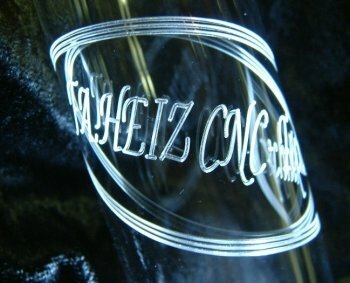 The most modern of all techniques today is the laser-engraving in which the material to be engraved is evaporated by the hot laser produced by the high temperatures of the laser beam at the machining point. By using the laser temperature control, it is now also possible to “engrave” semitones.